Not many artists in history can claim to have rendered a $40 million painting. But Freeport, Minnesota’s Scot Storm’s will most assuredly one day be able to count himself as one. That’s because his acrylic painting of a wood duck and decoy won the 2018 Federal Duck Stamp Art Contest. On Sept. 15, a panel of five judges chose an acrylic painting of a wood duck and decoy by Scot Storm as the winner of the 2018 Federal Duck Stamp Contest. Storm’s painting will be made into the 2019-2020 Federal Migratory Bird Hunting and Conservation Stamp, or “Duck Stamp”, which will go on sale in late June 2019. The Service produces the Federal Duck Stamp, which sells for $25 and raises up to $40 million in sales each year. These funds support critical conservation to protect wetland habitats in the National Wildlife Refuge System for the benefit of wildlife and the enjoyment of people. To recognize the contributions of waterfowl hunters, who have been instrumental in conserving our nation’s wildlife, all entries in this year’s contest were required to include depictions of one or more hunting-themed elements. Storm’s artwork featured a wood duck decoy. This is Storm’s second Federal Duck Stamp Contest win. His art previously appeared on the 2004-2005 Federal Duck Stamp. Of 153 entries in this year’s competition, held at Springs Preserve in Las Vegas, Nevada, 19 entries made it to the final round of judging. Eligible species for this year’s Federal Duck Stamp Contest were the wood duck, American wigeon, northern pintail, green-winged teal and lesser scaup. View the online gallery of the 2018 Federal Duck Stamp Art Contest entries. 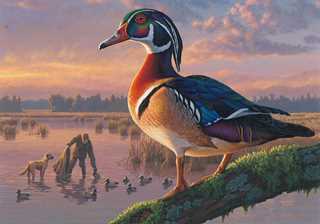 Frank Mittlestadt of Beaver Dam, Wisconsin, placed second with his acrylic painting of wood duck with a hunting scene in the background. 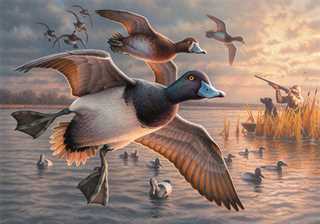 Greg Alexander of Ashland, Wisconsin, took third place with his acrylic painting of lesser scaup. 2018 Federal Duck Stamp Contest second place art. 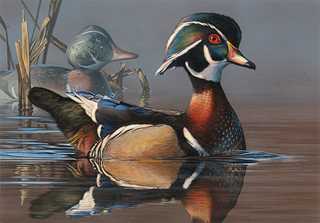 Wood duck (acrylic) by Frank Mittelstadt of Beaver Dam, Wisconsin. 2018 Federal Duck Stamp Contest third place art. Lesser scaup (acrylic) by Greg Alexander of Ashland, Wisconsin. Funds raised from the sale of Federal Duck Stamps goes toward the acquisition or lease of habitat for the National Wildlife Refuge System. This year, the Migratory Bird Conservation Commission awarded $22.9 million from the fund, made up partly of Duck Stamp dollars, to support the acquisition of refuge lands from willing sellers. The new areas provide additional access to the public to some of the most spectacular places available for hunting, fishing, birdwatching, hiking and other outdoor activities. You can contribute to conservation and America’s great outdoors tradition by buying Federal Duck Stamps at many national wildlife refuges, sporting goods stores and other retailers, through the U.S. Postal Service, or online at http://www.fws.gov/birds/get-involved/duck-stamp/buy-duck-stamp.php.